These handsome stamps feature a Hawaiian rain forest painted by John D. Dawson to remind us all of the important of preserving this habitat for the plants and animals that need shelter from civilization. 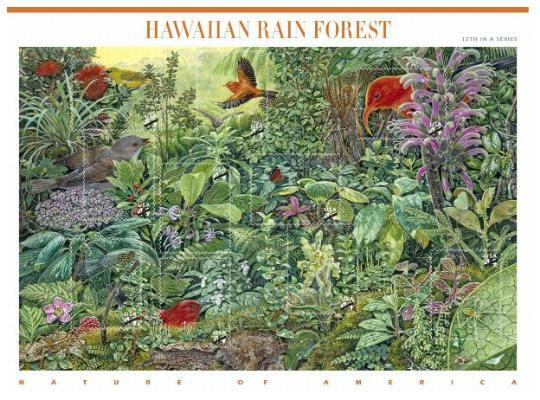 Featuring a Hawaiian rain forest, the 2010 Nature of America issuance is the 12th stamp pane in an educational series focusing on the beauty and complexity of major plant and animal communities in the United States. 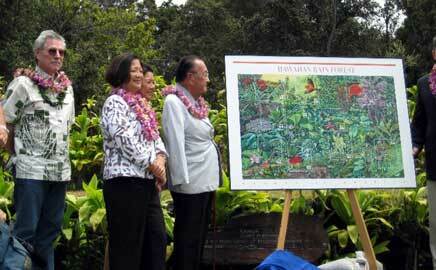 The setting for the colorful acrylic painting on the stamp pane is a rain forest on Hawaiʻi’s largest island, which is also named Hawaiʻi. Artist John D. Dawson painted the scene and each of the previous ones in the Nature of America series. To illustrate the spectacular biodiversity of a Hawaiian rain forest, the artist depicted more than 24 different species. The scene itself is completely imaginary. Such a dense grouping was necessary in order to show as many plants and animals as possible in the stamp pane format. Even so, every species depicted could be encountered in a Hawaiian rain forest, and all of the species and their interactions are appropriate and were recommended by scientists. A description of the rain forest and a numbered key to the artwork appear on the back of the stamp pane, along with a corresponding list of common and scientific names for 24 selected species.